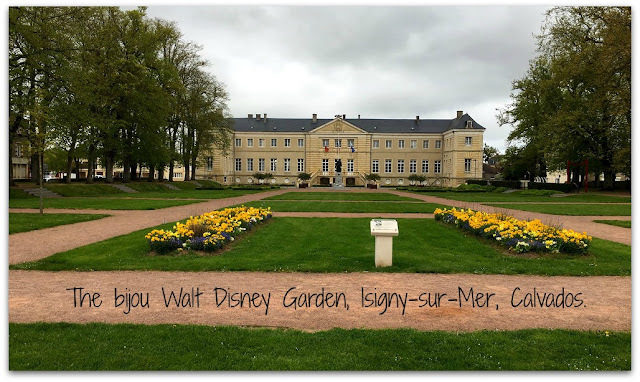 Normandy Life: Mosaic Monday # 36 - you say Disney and I say d'Isigny! Mosaic Monday # 36 - you say Disney and I say d'Isigny! The answer is this man! 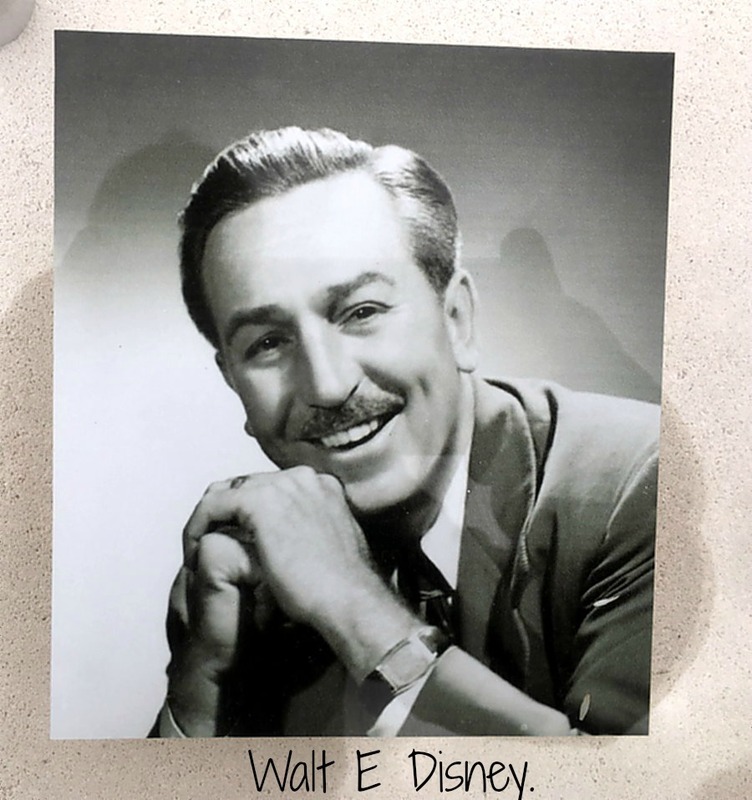 That's right, Uncle Walt's ancestry can be traced all the way back to Hugues Suhard and his son Robert who left Isigny sur Mer to fight side by side with William the Conqueror during the invasion of England in 1066. I always thought Isigny sur Mer was only famous for the wonderful butter, cream and cheese, produced by the Isigny Sainte Mere cooperative, using milk from Normandy's native breed of cows like these. Our farmer neighbour, Mark, supplies the co-op and we often encounter the huge tankers, in our narrow lanes, on their way to collect the creamy stuff. 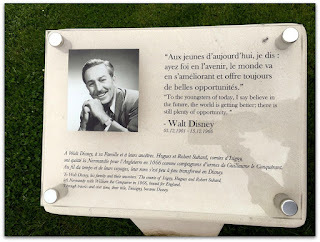 In the centre of Isigny opposite the Town Hall the Walt Disney Garden has been created. 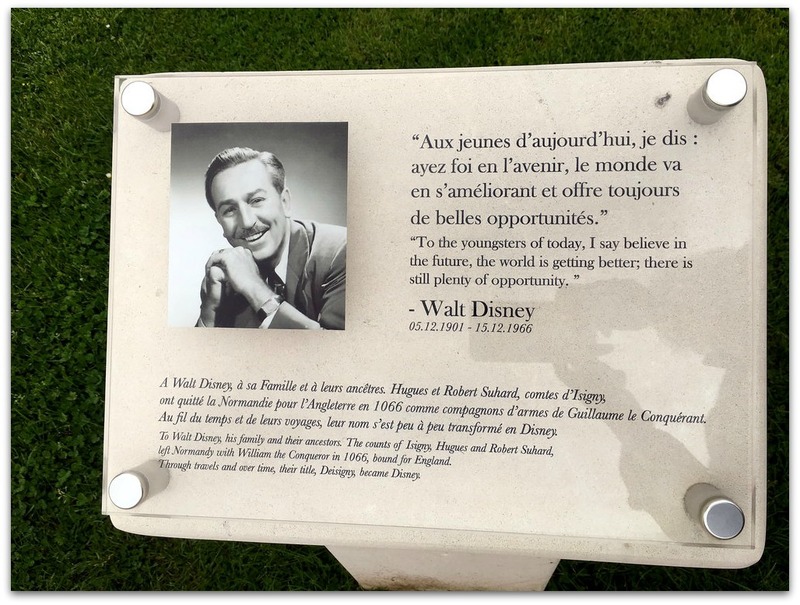 Here you'll also find a small plaque officially recognising what generations of children from Isigny have grown up knowing - Walt Elias Disney's ancestors were Normans! 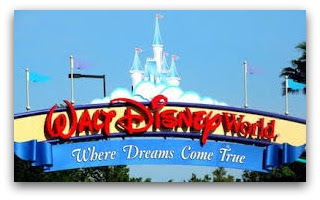 Click here to visit the Disneyland Paris website confirming the story. there is still plenty of opportunity. According to Madeleine Hubert, historian of Isigny, a charter of the King of England and Duke of Normandy Henry II, written in the 12th century, reports that Hugues Suhard, "guardian and master of the port of Isigny", took the name of Hugues d'Isigny. (His) descendants settled in England, many decided not to return to Normandy. Over the years, their name became more evocative. In 1150, the stronghold of Norton, in the center of England, belonged to a certain William of Ysini. There is also a Norton Is'ny in a charter of 1331. It was this Norton who later became Norton Disney. Several centuries later, around 1830, a distant descendant of Norton, Elias Disney, left his native Ireland for the New World. Walt Elias Disney's ancestry can be traced back to the Irish branch of the family. 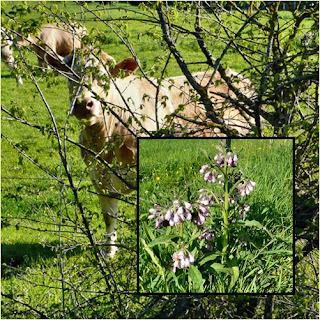 Wow - that is so interesting - I just love learning such things. Thank you for sharing. 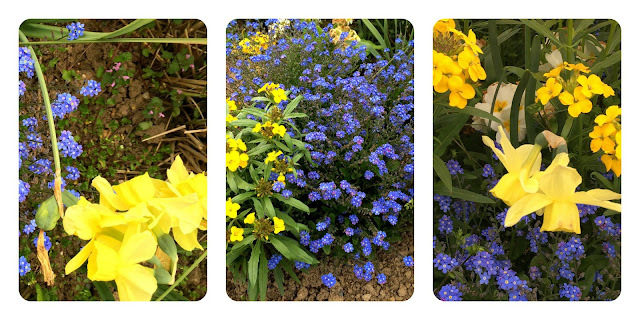 Lovely photos - the gardens are especially wonderful. You share the best information. Thank you Maggie for your 36th Mosaic Monday. Appreciated. What an incredible story. Interesting! Maggie, thanks for the interesting post. Hope you had a delightful Easter weekend. Ours was quiet and uneventful. Rather nice! 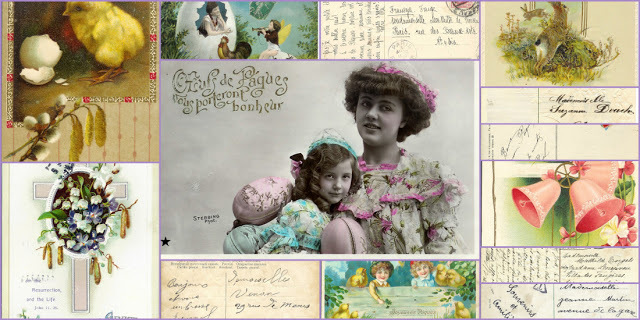 Yor Blog Post is simply stunning, darling Maggie, every Monday you amaze me, darling friend ! That is an impressive building & garden. Your Easter / Spring mosaics are a feast for the eye. Wow, I had no idea! What an interesting post, Maggie! And lovely photos. Thank you for hosting MM. Hope you are having a nice spring day. I learned something new this morning! I love Disney and really enjoyed this post. Happy Monday and thanks so much for hosting. This is such an interesting post, Maggie. Who knew? So many famous people were descended from the Normans. They've been a force to contend with in the world for a long time. Maggie, This post was very interesting and educational. Thanks for hosting and sharing. Sylvia D.
Interesting. We don't always put forth the effort to go back and back and back! Gosh, I had no idea Maggie - thanks for sharing all this amazing history. I would visit Isigny-sur-Mer before Disney any day - cheese-aholic me - and theme parks were OK when the kids were small, but not in this day and age! Off to cut a piece of cheese to go with my aperitif white wine right now! I worked in the garden so have earned it, right!!!!!! That's interesting! I see I selected the wrong image. Click through to see the mosaic.